The colors and patterns that a butterfly sees are invisible to man. The colors of flowers, the patterns of color on its own wings appear much different to a butterfly. This is because, the butterfly can see ultraviolet light. UV (ultraviolet) light comes from Sun. It causes sunburns in man. But the butterfly uses it in many different ways, for its vision and navigation. The butterfly vision system is far different from that of man. The butterfly has a pair of eyes on its head. Each eye is composed of thousands of image forming minute eyes called ommatidia. Such eyes are called compound eyes, very characteristic of insects. 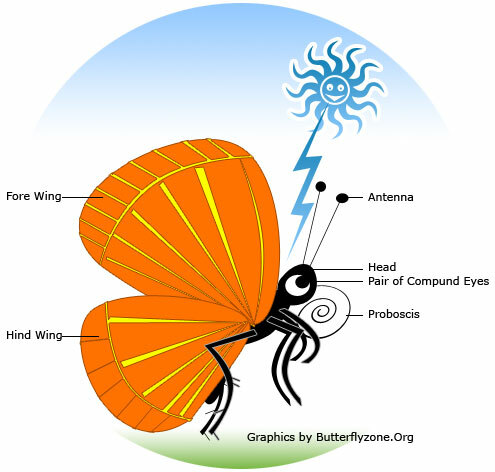 With the compound eyes, the butterfly enjoys a wide field of vision. This is facilitated by the ommatidia. The ommatidium is a minute sensory structure with a lens, crystalline cone and retinal cells. Each ommatidium is directed at a different angle from the others. Collectively they are directed in all directions. This enables the butterfly to see simultaneously in every direction. The vision is called Omni vision and the image the butterfly sees, is in the form of a mosaic. The butterfly eye has three types of color receptors. This is termed Trichromatic vision. The human vision is also trichromatic, but there is a difference. The butterfly color receptors can perceive colors in a high frequency (frequency is a measuring unit of color)..The lowest frequency of color is red. The butterfly cannot pick up lower frequencies, and obviously blind to red. Man cannot detect higher frequency colors beyond violet, and therefore blind to ultraviolet. Between man and butterfly, there is one more difference. The butterfly cannot focus its vision. Therefore, what it can see is only a blur. But this seems to be sufficient for the daily activity of butterfly. It can distinguish night from the day and is sensitive to movement. It can escape from an approaching predator or a clasping hand, fast enough. Isn’t that enough?